Students from South Texas College of Law Houston recently experienced a once-in-a-lifetime opportunity: learning from a justice of the nation’s High Court in an intimate, one-on-one setting. The Honorable U.S. Supreme Court Justice Ruth Bader Ginsburg taught during the third session of STCL Houston’s study abroad program at the University of Malta’s Valletta campus the week of July 4. Justice Ginsburg provided the future lawyers with a retrospective of prominent Supreme Court cases over the past year, conducted a Q&A session, and attended a reception for participating students and faculty in her honor. Revils is such an admirer of the justice, she named her dog, “Ginsburg,” well before she knew she’d have the opportunity to meet her idol. When the two had the chance to interact one-on-one during the Malta program, Revils showed the justice a photo of her dog and they shared a laugh together. Approved by the American Bar Association (ABA), the Malta program is one of several international legal study abroad options available to South Texas College of Law Houston students through the Consortium for Innovative Legal Education (CILE), which includes California Western School of Law, New England Law |Boston, and Mitchell Hamline School of Law, in addition to STCL Houston. Justice Ginsburg followed in the stead of Chief Justice John G. Roberts Jr. and the late Justice Antonin G. Scalia, who previously taught in international study abroad programs offered through CILE-affiliated schools in Malta, England, Ireland, Chile, and the Czech Republic. 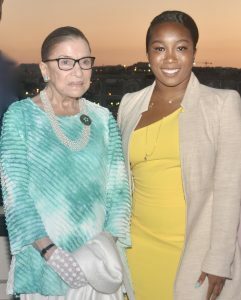 “Justice Ginsburg’s participation with STCL Houston’s Malta program this summer is an experience our students will forever treasure,” said Donald J. Guter, president and dean of South Texas College of Law Houston. “In addition to hearing her unique perspective on groundbreaking cases of the past year, the students were treated to her great sense of humor and grace in an interactive setting, which most students and attorneys never have the opportunity to experience. ”In addition to teaching law students, Justice Ginsburg made the most of her time in Malta, touring the St. John’s Co-Cathedral; the 5,000-year-old Hypogeum underground burial site; and the Hagar Qim Neolithic temple complex, dating from approximately 3400 B.C. Justice Ginsburg, appointed to the U.S. Supreme Court by President Bill Clinton in 1993, is the second female justice to sit on the High Court. She attended Harvard Law School and received her LL.B. from Columbia Law School. Prior to taking her seat on the U.S. Supreme Court, she served as judge of the United States Court of Appeals for the District of Columbia Circuit and professor of law at Rutgers University School of Law and Columbia Law School. 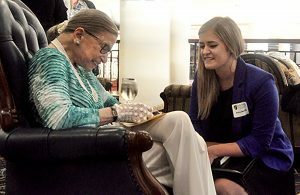 “Having the opportunity to share a one-on-one moment with Justice Ginsburg and tell her just how much I admire and respect her will forever be one of the highlights of my life,” said Morgan Walls, a second-year student at South Texas College of Law Houston.